When I first got involved in search work, I noticed a fairly shocking shortcoming: improving the quality of search results is an abysmal experience. Despite the fact that search drives the user experience for many apps, improving search is miserable. The actual hands on work to tune Solr & Elasticsearch results is more like mysticism than a robust repeatable engineering practice. Ask a search developer about how to improve the quality of your search results and they’ll start talking about Solr’s edismax, boosts, or Elasticsearch’s Query DSL. Tweak this, boost that, skew this. Render the right incantations to the search engine and hope all your application’s many search use cases will end up solved. “Tweak and Hope” is the only solution you have. Unfortunately “tweak and hope” often turns into whack-a-mole as you constantly fix one issue only to find you’ve broken others. Many simply arrive at the conclusion that “search is too hard” abandoning this core component of the user experience. Sadly users notice. Sales decline. Customers abandon you for the competition. I’ve been pushing OpenSource Connections to make it our mission to do better than this. Through my blogging, speaking and writing a book on the topic, the art of improving search results has become my passion. I feel very strongly we can make this a process any developer, merchandiser, or content expert can participate in. It’s not mysticism: it’s engineering! As a major piece of that mission, we’re proud to announce our Quepid product has graduated beta. What is Quepid? 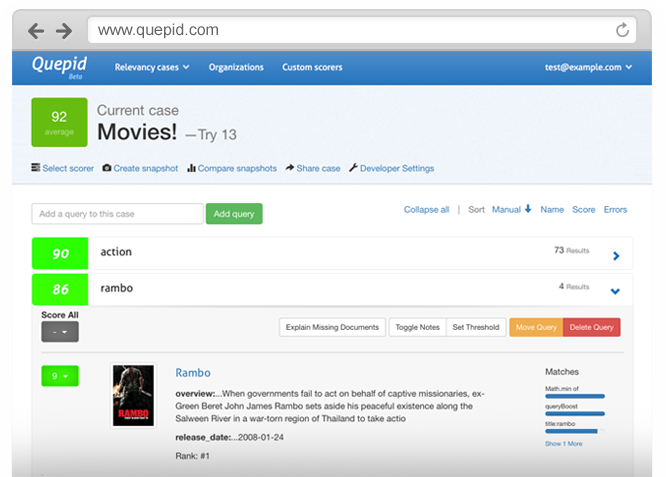 Quepid makes improving your search results accessible and transparent. It allows developers, merchandisers, and user/content experts to participate in the conversation about how search should behave. It turns their feedback into firm metrics that measure search quality, without the voodoo. Teams iterate in real time on search correctness, instantly seeing the impact of their changes, instead of blindly tuning, guessing, and breaking. I believe Quepid is the missing ingredient of Solr and Elasticsearch. I’ve enjoyed seeing how Solr and Elasticsearch have broken into exciting areas beyond search: analytics, recommendations, and even as primary data stores. Yet surprisingly few focus on Solr and Elasticsearch’s core functionality: the actual search ranking. It’s easy to see why: it’s not an easy problem.